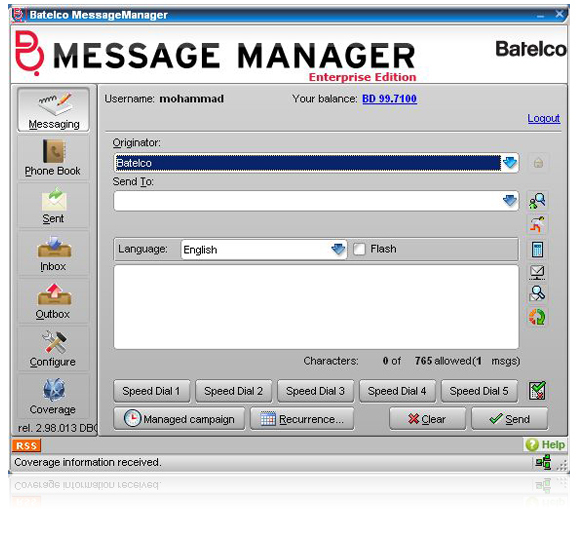 The Message Manager Desktop Client application allows you to send text and multimedia messages to mobile phones all over the world via Internet directly from your PC. With the latest Message Manager version you can also send messages from a dedicated mobile phone number using the Message Manager as an intermediary, to up to five different groups of recipients. • Create advanced SMS / MMS messages with the help of templates, personalization and customization features. For your MMS messages you can also use various media files which can be dragged-and-dropped into the messaging form or taken from external devices like a web-camera or an audio CD. • Create special-format messages like VCard or URL messages. • Receive messages to your Message Manager, and forward them to other recipients. • Analyze your incoming messages as, for example, opinion poll results, and present the analysis results as vivid charts. • Define actions which your Message Manager automatically performs in case the incoming messages meet the criteria you set. • Send your messages to multiple recipients from their specially defined mobile phones, using the Message Manager as an intermediary link.